Dancer had a teeter flyoff at age 2 that left her completely unwilling to do the teeter. She walked circles around it, glaring at it. 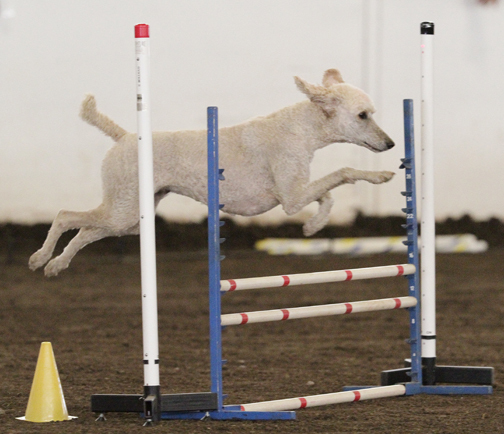 It took about three years of re-training before she was willing to do the teeter in competition, during which I learned a huge amount about building confidence and resilience in a soft dog. I learned not to let my shoulders sag or betray my disappointment–because if I did, Dancer sagged too, and I couldn’t bear it. I learned to end a run early and leave the ring to celebrate if I got a really exceptional performance. Yes, I ended runs where I could have Qed so I could reward my dog. Dancer needs so much to know that I think she’s wonderful, no matter what. Once she was doing the teeter with some degree of reliability–and it has never become completely reliable (I need to be right there, not be impatient, and the teeter must drop at just the right rate)–I had to deal with the consequences of my having done a very poor job of training her contacts. Doing three contacts in a course meant it was unlikely she’d get all three in a single run. I tried a lot of different methods of training contacts, but her response to trial stress was always pretty much the same: jump over the yellow. Just for the record, these are some of the methods I tried: running contacts using a hoop on the contacts (worked until she got into competition and sped up); running contacts using stride regulators (ditto); stopped contacts (worked once, then I let up on criteria–and the contacts were history); managed contacts–beat her to the end and stop her from jumping (worked until she learned to jump sideways or over my head)… and more. The method that currently sort-of-works is to lead her off the contact with my near hand about a foot ahead of her nose (notice this means I have to run with her and pretty close, at that); in practice I then swing in my off-hand and reward. The most important thing Dancer taught me? That–while I love the big ribbon!–I’d rather have a dog that wants to be in the ring with me than a dog that does agility only because I ask. I needed to help Dancer learn to enjoy agility and playing with me before I asked for Q-level performances. This entry was posted in agility titles, training, trials on August 4, 2014 by Diana. Dancer has been one standard Q away from her CPE C-ATCH title for four trials now. Contacts are a constant issue, which is why it’s been four trials, but I fully acknowledge my role in training those unreliable contacts. The problem I face, however, is grooming. This weekend, Dancer has two standard runs, and I am (as always) cautiously optimistic that one of those runs will be the run. Of course, that means I want Dancer to look good, should we have a C-ATCH photograph. So I have to do a little bit of show grooming. I trim face, I trim feet, I brush and scissor topknot and tail. How much grooming to do? Is too much grooming bad luck? Am I that superstitious? Maybe I should let the grooming go and go train contacts? Or weaves? What about weaves? Do border collie people face these questions? I doubt it, honestly. Maybe they pack a brush, just in case. 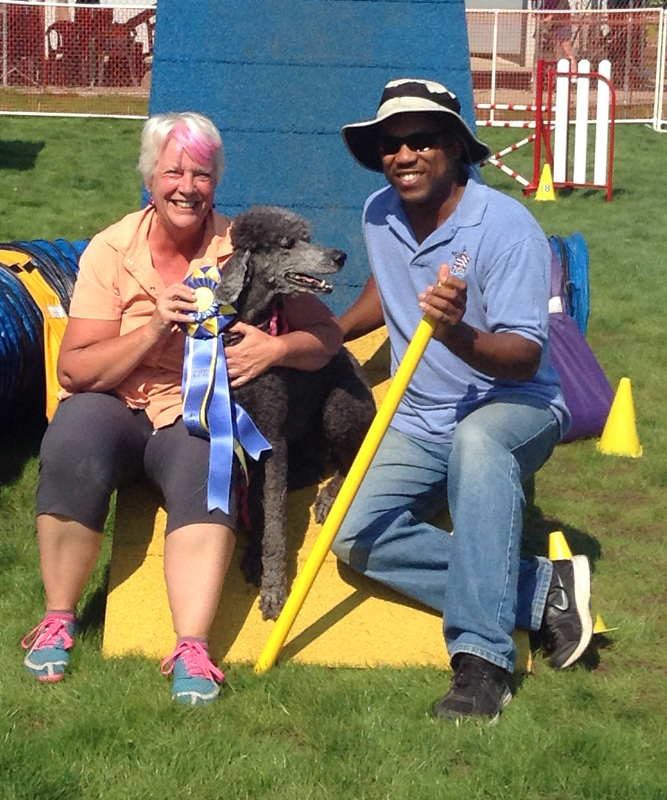 This entry was posted in agility titles on July 30, 2014 by Diana. Friday I took Dancer and Rush to an AKC trial, where I had both of them entered in the 20″ Preferred class. The huge big deal oh-my-god success was: Dancer did two teeters. The first one came in Excellent FAST where I asked for a-frame-to-teeter and she did it, after which I ran out of the ring with her and gave her a whole lot of chicken liver treats, also referred to as Poodle Crack (recipe here) in celebration. She liked that. The second teeter came in Open Standard, where she ran somewhat slowly and showed some signs of stress, did nice contacts, a nice teeter, a little hesitation at the double, calm table, a nice a-frame, clean weaves–and then went around the triple, which was the last obstacle, immediately following the closed chute, which always slows her down, so that she didn’t have much rhythm going into the triple… but I brought her around and she did take the triple. When I went to check the results, I was astonished to find out that she had in fact earned herself a Q in Open Standard Preferred, her third Q, and so she now had three more letters after her name: OAP. The experience of running Rush is so different that it astonishes me. After I ran Dancer in Excellent FAST, I went to the Novice FAST ring to run Rush. It took a bit of planning to come up with a course that would allow me to Q even if I decided I needed to leave with him after the a-frame. In several trials he’s jumped the a-frame when it was in the first run of the day. I’ve been working in practice on making sure he’s wound up and then asking for the a-frame… but I didn’t want to be tempted to continue if he did it again, just to get the Q. My rule with Rush is: you jump the contact, we leave. (Note that I’d never do this with Dancer; she’d be deflated.) So my plan was to put the a-frame after the send, and after I’d earned all the points I’d need. As I came to the line, I looked at the judge and said “take a deep breath” and then off we went. Three jumps to the send–tunnel-to-jump–no worries, then around to the teeter, again, no worries, then the weaves, then around again to the a-frame. He came to a beautiful stop at the bottom of the a-frame and waited, quivering with impatience, as I desperately looked for a good line out of the ring and over the finish jump. I’d forgotten entirely to plan for when he did do the a-frame to my standards. Whoops! When I released him, he flew by me, and I ran as fast as I could for the finish jump, arriving just after the time buzzer. Q, 65 points, and blue. He ran next in Novice Jumpers. Going in, he had two Qs in Novice Jumpers and I was hoping for the third. It was a course that was made for him, big swoopy lines, a tricky rear cross at the double (where the obvious handler line was flat across the take-off side of the double). Four jumps in a line at the end of the course. I thought it would run fast, but I’m still not quite used to the way Rush runs jumpers. 100 yards and he ran it a hair over 19 seconds. And that’s with the spin he put in before the last jump when I got too far behind for his training. The leash runner got caught up watching him and forgot to bring his leash over…. that was a small thrill for me; I love knowing people enjoy watching him run. Standard Course Time was 41 seconds…. Yes, he got the Q, but the spin meant a five-point fault, and he ended up second. Still, that’s his NJP title. His Novice Standard run was a classic “almost” run. But for a premature exit out of the weaves (and only 6 poles at that!) and into a tunnel–thereby incurring a “failure to perform” fault, which makes a Q impossible–he ran very well for a young dog. His contacts were excellent; he did a nice down on the table the first time I asked; his second pass through the weaves was lovely. He was focused and doing his best to please. 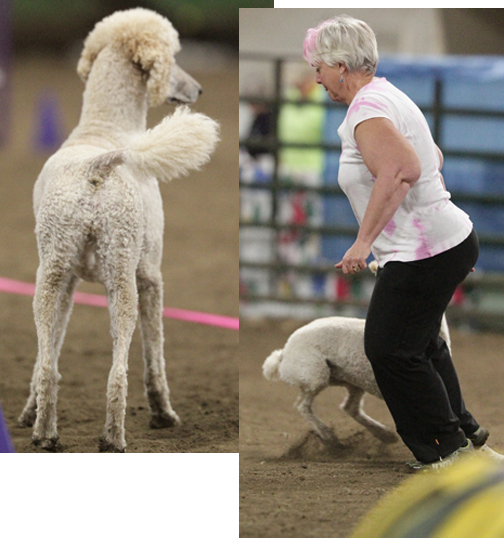 This entry was posted in agility titles, training, trials on March 17, 2013 by Diana. Finally home after a trial, a trip to Kansas, and another trial. I’m exhausted. I had a good time with my sister, however, and enjoyed seeing my brother and his wife and one of my nephews. Dancer has been doing very well indeed in NADAC, including one of the most amusing two-on-two-off contacts ever on Saturday…. She stopped just above the yellow–because I’d stopped–and then dropped off the side in a very nice stretched-out contact. The judge laughed; I laughed; spectators laughed. But the fact is, she gave me great contacts this weekend. We took second in one round of Elite regular today–and first in the other. I should add that she was the only 20+ dog to Q in both rounds. People thought they were tough courses with tight call-offs; I thought there was plenty of room if I cued the turn well, and I would say that Dancer agreed. She finished her Elite Regular title today. She Q’d only in Jumpers yesterday, but we were both re-syncing after my five days away, and parts of every single run were great–just not the whole run. Even in the Jumpers run, I felt she could have done better (she was fifth–how embarrassing!). Dancer got her first ever Q in Elite Chances today, including a TWENTY-foot distance line parallel to the dogwalk. I was very pleased yesterday with Elly, who got her third Q (ever) in Novice Touch-N-Go and now has her NADAC Novice Versatility Award. 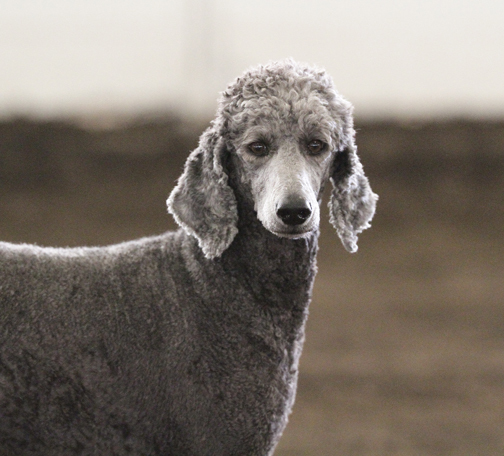 To my knowledge, only about fifteen standard poodles have gotten the award (Dancer of course is one of them). As I said to a friend (who knows Elly well), for Elly, the Novice Versatility Award is like a MACH for any other dog, given her challenges. This entry was posted in agility titles, trials on June 12, 2011 by Diana. Outside in the rain, on wet grass and mud. In the sun. In the drizzle. In the hail. In the rain. It was weird, cyclic weather that went on and on. From one minute to the next, it was impossible to know what the conditions were going to be. I covered my car with my silver cloth–mostly to keep the environment dark and relaxing–but there were times when the sun came out and the grass began to steam. Surprisingly, it was a lovely trial. It was one ring, small and intimate and very friendly. No one whined about the weather. Everyone (seriously) volunteered. I know this to be a fact, because I was the chief ring steward, and I had zero problem finding volunteers. This entry was posted in agility titles, trials on May 9, 2011 by Diana. Elly got her first (and so far, only) Elite title: NADAC Elite Agility Skilled (EAS). Elly also got the only two Qs she has ever gotten in NADAC’s Touch N Go game. One more and she’ll have her Novice Versatility title. That would be a nice accomplishment for 2011. Dancer got her first (and so far, only) Elite title: NADAC Elite Jumpers Certificate (EJC). She also got her Novice Versatility and her Novice Triple Superior. After two years of retraining, Dancer did the teeter in a competitive environment during 2010. We are opening 2011 with an AKC trial, and I have high hopes that she will do the teeter during her Novice Standard run. I’m even hoping for a Q or two in Novice Standard. We’ll see. As for me: well, I’ve lost 18 pounds this year. That’s made me a bit faster and my knees hurt a bit less. Every little bit helps. Next year… well, another 18 would be nice. 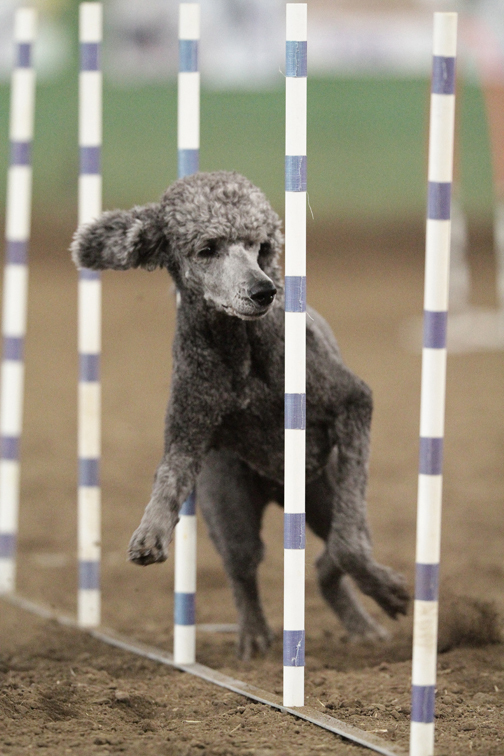 This entry was posted in agility titles, life with poodles, training, trials on December 31, 2010 by Diana. The WAG NADAC trial was a long weekend of highs and lows. I got back from a week-long visit to my sister in New York on Wednesday, trained a little bit on Thursday, and went off to the trial on Friday. Friday evening was Touch N Go and both dogs ran; neither Q’d. It was a flaming disaster of missed contacts, late cues and misdirections, and fast unfocused dogs. Actually, Elly did get all her contacts–just didn’t do most of the rest of the course. We moved on to Tunnelers, where my late cues confused Dancer and sent her off-course. I went back to the hotel and slept deeply and well: Saturday was another day. The Open Chances course looked like an excellent course for both dogs, as it included some of the exact things I’d been training (weaves at a distance, a tunnel/dogwalk discrimination). I ran Dancer first, and she ran well and Q’d easily. Elly went around a jump but otherwise also did well–she did choose to skip the weaves. On to Regular, where Dancer and I were E’d for training contacts in both runs. She was really flying, and stopping just didn’t seem to be in her agenda. I am vacillating about training a running a-frame. That would be contact option number four, and I’ve been successful with none of them. From there to Elite Jumpers, where Dancer got her second Elite Jumpers Q with a spectacular run in the 20+” class, taking second! Then Hoopers–and I sent her off-course. (Elly also ran in Hoopers, and provided crowd entertainment.) Our final run of Saturday was Open Weavers, where Dancer placed first, narrowly faster than the dog that won Elite Jumpers. Sunday began with Chances again. The course was rather more complex than Saturday’s–four spots I identified as challenges. The first included two jumps in a line and than a turn to another jump–with the tunnel beckoning, straight ahead. Dancer shot past me and into the tunnel before I could turn her, but completed the next two challenges–two jumps and a turn to two out jumps, then a tunnel/dogwalk discrimination–and flew through to the finish (including the last challenge: getting a push to a hoop followed by a pull to a tunnel). So no Q, but an exciting run nonetheless. Elly then provided more crowd entertainment. She began her Chances run nicely, then stopped dead on the other side of the line and stared at me, tail up and slowly wagging. Clearly, she was contemplating her next move. I did a play bow toward her, and she flew to me, and I turned her to finish the course… which she did, sort of, but getting the dogwalk instead of the tunnel. From there, Dancer and I went on to two failures in Regular (problems with contacts, what a surprise) and a fourth in Elite Jumpers, finishing her EJC title. The power failed, and WAG continued on, pulling out stopwatches to hand-time the final class, Weavers. Dancer once again placed first in Open Weavers, with the best run she’s ever had in Weavers, running 4.9 yards/second, faster than she’d just run in Jumpers. That finished her Superior Open Weavers title, and we move to Elite in Weavers. Elly: no Qs, but a lot of fun, no stress, no limping, kept playing with me all weekend. 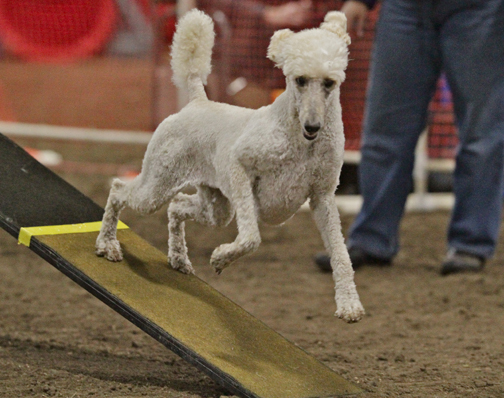 This entry was posted in agility titles, training, trials on October 25, 2010 by Diana. I took the girls to the Columbia Agility Team NADAC trial, just a short drive away. What a luxury, to sleep until 6:30 and still be at the trial before 8! It was an astonishingly good weekend. Dancer got THREE Qs in Novice Regular and finally finished her Superior Novice Regular title, which also meant that she finished her Novice Triple Superior award (meaning she has Superior titles in Regular, Jumpers, and Chances). She got an Open Chances Q (only her second one: those twenty-foot sends are a major challenge). She got a Q in Open Hoopers (and her Outstanding Open Hoopers title). To me, the biggest deal of all, though, was her FIRST EVER Elite Jumpers Q. I’ve struggled with making time in Elite Jumpers. There’s just no room at all for error. None. For the last few weeks, I’ve been doing sprint training with Dancer: a line of four jumps to a tunnel (as described in a previous post). I could not believe it today when the opening to the Elite Jumpers course was: four jumps in a straight line to a tunnel. As I said to a friend: how often in a trial do you get something you’ve just spent the last two weeks training?! Of course I’ve also been doing my own sprint training, and I would like to report, quite proudly, that I planned and got to three front crosses. Dancer is definitely faster with front crosses and it’s quite a challenge for me. But I got there. Dancer even got FOURTH place in the large 20+ field. As for Elly, she also made me proud. I’ve been working a bit on her contacts–not too much–and she got her second-ever Touch-N-Go Q! Good girl! This entry was posted in agility titles, training, trials on September 12, 2010 by Diana. I took the girls to the CAT CPE trial in Ridgefield this weekend. It is SO nice to have trials only 25 minutes from home. And no need to set up a tent. It made lugging in the crates seem like a minor job. Dancer ran in Level 2 Standard for the first time. That meant: the teeter. Now, she’s done the teeter a few times in competition now, but of course, this was a new place and a new teeter. Saturday, both times, she got on the teeter and took a few steps and jumped off. Sunday, when she stopped in the first run, I put my hand on her back and gently kept her from jumping off, while lowering the teeter with the other hand. Yep, that would be training in the ring, so I then thanked the judge and we left immediately and ran ran ran to her treats–freeze-dried turkey hearts, which appear to be basically some sort of addictive poodle drug. In the second run, she was having a wonderful fast run with lots of distance and speed, and I made sure to meet her at the teeter. I coaxed her across and you could see her make up her mind to do it (I even said “you’ve done it once, you know it’s not that big a deal”) and then she went on, fast and happy, got all the contacts, second place. In addition to her Standard Q, Dancer also earned Qs (2nd) in Colors, Wildcard (3rd), FullHouse (1st), Snooker (1st), Jumpers (1st). Elly’s Rimadyl is clearly making a big difference. She ran well and Qd in FOUR runs on Saturday! However, that turned out to be overdoing it a bit, and she only did one good run on Sunday–in the other, she asked to leave, so we did. Elly earned herself Qs in Wildcard, Jackpot, Standard, Snooker, and Colors. In Snooker on Sunday, we had the pleasure, as we finished the run, of hearing the judge say “first dog to make it to 7!” Elly reached the table just as the buzzer went off, signaling that it was time to get to the table. That was a fun run. Standard, Level 2: 155 yards, SCT 67, 45.33 seconds, 0 faults, 2nd. 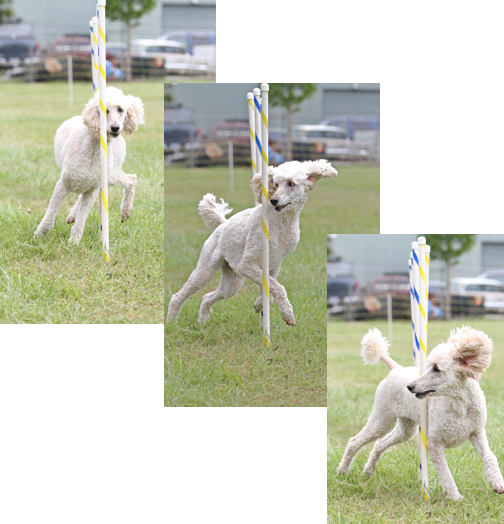 This entry was posted in agility titles, Photos, training, trials on August 23, 2010 by Diana.